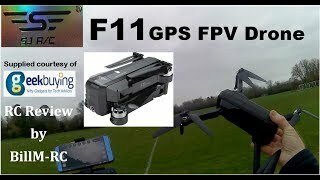 The SJRC F11 is especially interesting because it can fly via GPS. And the price is not too expensive. With the help of the GPS the SJRC F11 can fly very smoothly in this position. And this works as expected very well. Both the altitude and the position of the F11 are almost accurate. 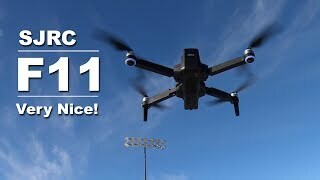 Like so many copters the SJRC F11 has an integrated WLAN which is automatically switched on as soon as the drone is switched on. Matching it there is the Smartphone App SJ GPS Pro which you can download from the Play- or App Store. The app is necessary to calibrate the GPS properly. You can also see the live image from the camera on your smartphone. Interesting are also the limits you can set in the app. By default the Beginner mode is set. This means the SJRC F11 does not fly further than 30 meters and cannot fly higher than 30 meters. If the copter is more than 10 meters away, then the drone flies 25 meters upwards first, if the Return-to-Home function is switched on. The beginner mode can be switched off so that you can set all 3 values manually as you like. I now have 2 flights with the SJ R/C F11 behind me. And almost everything went well. What was rather negative? I couldn’t try the WayPoint mode because the app crashes when I want to run this function. The GPS Follow-Me function worked well so far. On the 2nd flight I ran out of the camera once too fast and then the F11 was a bit confused :). Otherwise the Follow-Me function works well. Unfortunately the Orbit Mode is not directly selectable in the app. This only works with a key combination on the remote control. The camera quality is rather a toy. Beside the negative aspects the Copter was otherwise very good. The control is very direct and the GPS works fine. The SJRC F11 can also be folded up so that it is easy to transport. This also works quickly and well with the included packaging. The Follow-Me function via Image Tracking also worked wonderfully. In this mode the Copter doesn’t track directly, but it turns in your direction. Before that you have to “circle” yourself in the app with a square. Also the Return-to-Home function does what it should. The battery life and flight distance were also very positive. More details in the next section. The SJRC F11 has a 2500mAh 3 cell battery. This allows it to move the copter, which weighs over 500 grams, quite quickly without any problems. By the way, with this weight a sticker with name and address is necessary! There are 3 speed levels which can be adjusted by remote control. With the battery you can fly for about 25 minutes. This works also in practice very well, despite fast flight. The maximum flight distance is 500-800 meters. But that depends on the version of the F11. More about this in the next section. As already mentioned, the remote control also has an integrated battery. At the price you get a neat, collapsible GPS Copter. You have to cut back on camera quality. But I couldn’t test the Pro version of the F11. The camera will certainly be a bit better. But the Full-HD camera is rather modest. Otherwise the F11 scores with the GPS and the easy handling. So it is especially suitable for beginners who don’t want to spend too much money in the beginning.